True immigration reform that deals practically and responsibly with the 11 million people living in the United States without immigration status has proven elusive over the past decade. Partisan gridlock has repeatedly prevented Congress from overhauling the immigration system. As a result, the only constants in our nation’s immigration policy during this period have been massive increases in border and interior enforcement efforts. These showed some results at the border but no tangible decline in the resident unauthorized population until the start of the Great Recession of 2007–2009, during which undocumented immigration slowed to a net zero, with slightly more people leaving the country than entering it. With the re-election of President Barack Obama due in part to unprecedented Latino support, the punditry is now, belatedly, suggesting that the time has come for Congress to overcome the paralysis and enact legislation that creates a pathway for our 11 million undocumented immigrants to earn citizenship. It appears that the inside the Beltway conventional political wisdom is finally catching up to American public opinion, which overwhelmingly supports dealing with these immigrants in a smart and sensible manner. Over the past decade enforcement policies have not only failed to deliver commonsense reform but have also impeded progress on a host of other important national issues. The ripple effects of having such a large unauthorized group of people among us hampers our ability to rationally debate issues like health care, education, taxes, benefits, and identification. This issue brief surveys many of the federal, state, and local issues that are stalled, warped, or completely derailed by the gridlock over immigration reform. The policy arguments in favor of common-sense immigration policies that chart a path to legal status for unauthorized immigrants are as numerous as they are compelling. Indeed, the only sensible approach from a fiscal, economic, social, and security perspective is to create a roadmap for these immigrants to earn citizenship. More than two-thirds of the immigrants working without papers in the United States have contributed to our economy and culture for more than a decade. But our outdated and misguided immigration policies, along with our polarized immigration politics, block them from realizing their—and our nation’s—full potential and forces them to live in fear of being ripped from their families. Bringing these hard-working immigrants off the economic sidelines would generate a $1.5 trillion boost to the nation’s cumulative GDP over 10 years and add close to $5 billion in additional tax revenue in just the next three years. Registering these immigrants with background checks would ensure that we know who is here and will enable our authorities to focus enforcement resources on criminal elements and security threats instead of hard-working family members. Bringing these immigrants out of the shadows would strike a blow to unscrupulous employers who mistreat their employees (immigrant and native-born alike) and help ensure worker safety for all. Enabling immigrants to earn legal status and to openly participate in civic life will strengthen our communities and reduce marginalization and exploitation. In other words, virtually everyone except exploitive employers and criminals is better off by enabling these immigrants to work above board and pay their full taxes. So if it’s a policy “no-brainer,” why hasn’t reform happened? Only politics can explain why immigration reform has not yet crossed the congressional finish line. The September 11 attacks stopped a potential immigration reform package in its tracks. Before the attacks, then-President George W. Bush met with Mexico’s newly elected president, Vicente Fox, five times in nine months and, seeing that Latinos were becoming the important group of swing voters we know today, called for bilateral immigration reforms. Following the terrorist attacks, however, immigration enforcement became synonymous with fighting terrorism, and any talk of reform for our broken immigration system was left at the starting line. Since then, immigration hardliners have effectively used fear mongering about immigrants, particularly those without legal status, as a political hammer in party primary elections. Candidates who fail the hardline immigration litmus test are threatened with challenges from the extreme right. As a result, the Republican Party’s posture on immigration is now well outside the mainstream. But with a massive demographic shift already underway in this country, it is in the self-interest of both political parties to end the demonization of undocumented immigrants. Using immigrants, even those without proper papers, as a political football is not merely crass wedge politics—it is also self-destructive. Latino voters, who are by definition documented, have a deep and personal association with the immigration issue, and they are now a political force with which both parties must reckon. More than half of all Latino voters know someone who is undocumented, and one-quarter know someone who is either facing deportation or has been deported. Those voters unsurprisingly view the politicians who launch broadsides against their families and communities with jaundiced eyes. Latinos comprised 16.7 percent of the population in 2011 and an estimated 11 percent of the electorate in 2012, and their numbers are projected to rise to 31 percent of the population by 2050. Latinos as a voting bloc have now shown the power to decide state and national elections. Continuing to alienate this rapidly growing segment of the electorate by espousing anti-immigrant policies spells future electoral doom. The results of this year’s presidential election point squarely to the political imperative of moving forward on immigration reform. Republican presidential candidate Mitt Romney adopted one of the most extreme immigration platforms of a presidential candidate in recent memory. That move to shore up a fringe of his party in pursuit of the nomination doomed his ability to compete for the vote of Latinos and other immigrants. Exit polls show that a meager 27 percent of the Latino vote went to Gov. Romney, a full four points below the 31 percent of Latino voters who cast their votes for Sen. John McCain (R-AZ) in 2008. As our nation’s demographics continue to shift away from a white majority, that anti-immigrant posture is untenable for a party that has its sights set on a return to the White House. President Barack Obama, for his part, openly acknowledges the significance of the Latino vote in returning him to the White House, and he is committed to moving forward on immigration reform in 2013. So the issue is politically ripe on its own terms. But tackling it now carries the significant additional benefit of opening space for constructive bipartisan dialogue on a host of other issues. This is because the political paralysis over addressing unauthorized immigrants has warped policy beyond the immigration arena. In the following pages, we provide examples of how this policy pothole has caused traffic jams on a host of other national and local issues related to health care, education, benefits, identification, and the workforce, and we highlight why addressing the immigration status of unauthorized immigrants will enable us to more effectively resolve these important issues. In other words, we show why charting the undocumented population on a road to citizenship will help stimulate constructive solutions in other policy arenas as well. Debates over health care access and insurance coverage for immigrants are emblematic of how the failure to deal responsibly with the nation’s large undocumented population infects debates over other policy initiatives. One painful example emanates from the critical national challenge posed by efforts to control health care costs. One of the central cost problems in the United States has been the large number of Americans who lack health insurance. When they get sick or injured, those costs get foisted onto society through increased health insurance premiums or taxes for safety net health care programs. A central premise of the Affordable Care Act’s cost-containment strategy, therefore, is to increase access to affordable health insurance and incentivize its purchase. Ultimately, however, the Affordable Care Act barred undocumented immigrants from buying insurance through the state-based exchanges—even if they have the means to do so. Failing to extend this goal of inclusion to the millions of unauthorized immigrants living here will undoubtedly compromise the system’s ability to lower costs. Denying these individuals access to insurance and blocking them from primary and preventive care alternatives means they often wait to seek care until a medical condition has reached a crisis point. And although this cohort is younger and healthier than the average, when they finally do seek assistance, they often go to the one place required to deliver it: the far more costly emergency room. Even though bringing undocumented immigrants into the health insurance system seems obvious from a cost-containment perspective, efforts to deal constructively with this issue are proving to be virtually impossible as a political matter. Indeed, one of the most virulent strains of opposition to the Affordable Care Act, or “Obamacare,” was premised on claims that it would provide health insurance access to undocumented immigrants. Who can forget the moment when Rep. Joe Wilson (R-SC) interrupted the president’s address to Congress on health care reform in September 2009 by standing up and shouting, “You lie!”? What some people may not remember is that the congressman’s outburst came in response to the president’s unequivocal declaration that the health care bill would not extend insurance coverage to undocumented immigrants. Despite the fact that it is plainly good policy from a health care and economics perspective, extending meaningful coverage to undocumented immigrants never stood a chance politically because of incendiary opposition like Rep. Wilson’s. Even though such coverage was not in the bill, it was nonetheless used as a scare tactic by those who wanted to preserve the status quo on health care and immigration policy for political reasons. In other words, Congress ultimately compromised wholly unrelated health policy reforms that would advance our nation’s interest in containing costs to resolve the immigration status of people working in the United States without papers. There are approximately 2.1 million undocumented immigrants who were brought to the United States before the age of 16 and have been here for more than five years. This large pool of undocumented students creates significant challenges for smart education policy in the states. On the one hand, the Supreme Court ruled in the 1982 case Plyler v. Doe that kindergarten-through-12th-grade public schools are constitutionally bound to educate all students, regardless of immigration status, and that allowing all children in the United States access to an education is good for the nation as a whole. On the other hand, federal law attempts to block states from granting in-state tuition for undocumented students who want to further their education by attending college. This creates an obvious tension. States are required to invest in the primary and secondary education of children and yet they are discouraged from reaping the fruits of that investment by effectively blocking higher education opportunities. Navigating this tension creates challenges for states seeking to adopt forward-looking education policies. A more recent and disturbing approach, beyond simply blocking students from obtaining affordable access to higher education through in-state tuition, directly challenges the Supreme Court precedent in Plyler in an attempt to further marginalize undocumented immigrants. Alabama’s recent immigration law, H.B. 56, for instance, forces schools to collect information about the legal status of their students and their parents. When the first judge to hear a challenge to H.B. 56, Sharon Lovelace Blackburn, failed to overturn the education provision, Alabama’s public schools saw a marked drop in the number of Latino students attending. The U.S. Court of Appeals for the 11th Circuit put the education provisions of H.B. 56 on hold, marking another blow to the strategy of challenging Plyler. It still reflects frustration, however, about the federal government’s failure to create a sensible immigration process. A more thoughtful approach to the education conundrum is to follow in the footsteps of the 12 states that have successfully crafted their tuition policies to explicitly offer in-state tuition to unauthorized immigrants. States such as Maryland and New York point to the low costs of doing so and the high return on investment from gaining a college education. But even this last approach of continuing investment in these children begs the question of what happens after they graduate from college. Because these state bills cannot grant them legal status, their horizons remain limited. The best solution would be for Congress to provide a pathway to legal status through something like the DREAM Act, a bill to help undocumented youth. 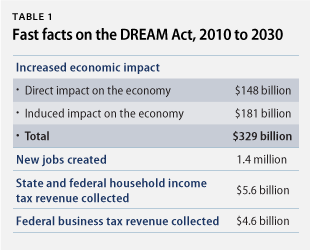 The DREAM Act would provide a significant boost to our economy, adding $329 billion by 2030. Legal status provides DREAMers with a powerful incentive to get more education, as the provisions are tied to completing high school and some college or military service. Combining that education with the ability to work legally enables immigrants to obtain higher-paying jobs. Increased earnings translate into higher revenue for the federal government and more spending on goods and services, growing the overall size of the economy. Ultimately, passage of the DREAM Act would create 1.4 million new jobs and add at least $10 billion to the nation’s revenue by 2030, which is good for all Americans, immigrant and native born alike. Without a sensible policy that enables the nation’s undocumented population to earn legal status, states are left with few good options to maximize the potential of a highly educated workforce. Perhaps the most direct collisions between smart public policy and a large unauthorized population occur in the realm of public benefits. Restricting eligibility for public benefits is central to conservative attacks on what they call the “welfare state.” One tactic these conservatives adopt in their crusade is the argument that public benefits might flow to immigrants, especially to those living here without legal status. Even though most immigrants—including those legally present—are barred from most public benefits, the issue is a perennial one. By using benefits to unauthorized immigrants as a stalking horse, conservatives create space to argue for policies that effectively limit benefits for all Americans. Two of the most recent and persistent lines of attacks have been on the child tax credit and the Supplemental Nutrition Assistance Program. In May of this year, Sens. David Vitter (R-LA) and Marco Rubio (R-FL) attempted to use the canard of undocumented immigrants falsely claiming the child tax credit—a refundable credit designed to keep children from falling into poverty—to restrict access to the program as a whole. This is just the most recent in a series of assaults on the child tax credit that have been launched in the name of blocking undocumented immigrants from receiving a federal benefit. Eligibility for the child tax credit is tied to the status of the child in question, as the program is designed to keep children, rather than families, from falling into poverty. Children must be younger than 17 and either a U.S. citizen, U.S. national, or U.S. resident alien. Sens. Vitter and Rubio claimed, using the dubious assertions of a single tax preparer, that undocumented immigrants were falsely claiming the credit for many fictional children. But aside from the fact that to claim the child tax credit you have to prove that the child in question is legally eligible, and that instances of trying to claim the same child twice, or fictional children, would almost certainly trigger an audit by the Internal Revenue Service, the solution that Sens. Vitter and Rubio propose—to restrict eligibility of the program as a whole to only families with no undocumented members—is a clear case of throwing the baby out with the bathwater. Instead of proposing additional checks to ensure the status of the children, the senators suggested restricting overall eligibility for a program that in 2009 kept 1.3 million children from falling into poverty. These are American citizens—all of them, regardless of the legal status of their parents. Putting undocumented immigrants on a path to legal status would prevent opponents of the credit from using the immigration status question as a smokescreen for their anti-safety net agenda. Opponents of the child tax credit should make their case against it on the merits, not through scare tactics in service of policies that will hurt American children. Just as importantly, creating a path to legal status will enable these immigrants to increase their earnings and our tax base. The Supplemental Nutrition Assistance Program, or SNAP, provides more than 20 million children with access to healthy food and is a key program that keeps families from having their children go hungry. To be eligible for the program, the recipient must be a U.S. citizen or lawfully present noncitizen. Yet in the most recent fight to reauthorize the program through the 2012 Farm Bill, amendments by Sen. Jeff Sessions (R-AL) and Rep. Martha Roby (R-AL) would have restricted supplemental nutrition assistance only to families who could prove that each and every member was legally present. As with the child tax credit issue discussed above, families with an undocumented member would be ineligible for supplemental nutrition assistance, even if the child receiving the benefit were a U.S. citizen. In fact, 16.6 million people live in mixed-status families. And as the advocacy group First Focus points out, these cuts would impact up to 4.5 million citizen children—80 percent of whom are Latino. Immigrant families are already less likely to apply for nutrition assistance than are native-born families, yet these amendments sought to make it harder for anyone with an undocumented family member to apply, another way to try to cut the overall number of people using the program. 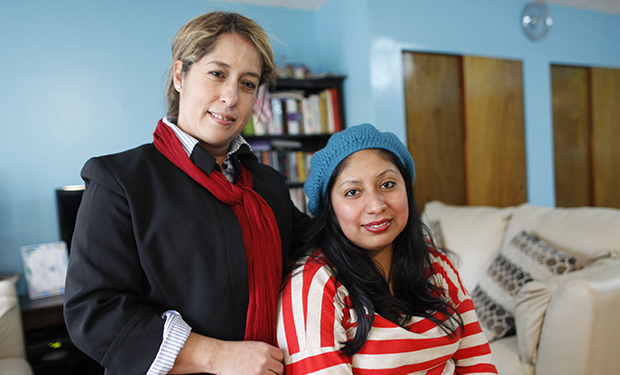 Many low-income families may not be able to produce the documentation necessary to prove the legal status of every family member, even if no one in the family is undocumented. Using immigration status as a wedge issue to attack public benefits has been a perennial congressional tactic. Dealing responsibly with the nation’s 11 million undocumented immigrants would remove this line of attack and return focus to the real issue—the attempts to dismantle the social safety net. What’s more, putting these immigrants on a path to legal status would significantly enhance their earning potential and minimize their need to access this type of assistance. The presence of a large unauthorized group of workers and families leads to a number of different issues related to identification. From driver’s licenses to voter identification to employment authorization, the reality of millions of undocumented immigrants among us triggers debates over how to properly identify the documented and the undocumented. But these policies do not operate in a vacuum, instead carrying implications for all Americans, including the native born. 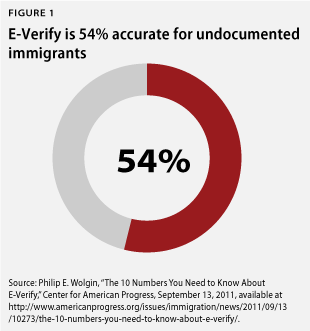 Among the most popular proposals to restrict undocumented immigrants and accomplish “attrition through enforcement”—making life as difficult as possible so that unauthorized immigrants self-deport from the United States—is E-Verify, an online system to check an employee’s work authorization status. Chief proponent and House Judiciary Committee Chairman Lamar Smith (R-TX) calls E-Verify “a successful tool for employers looking to hire a legal workforce,” and states that the program “helps reduce the jobs magnet that encourages illegal immigration.” His recent bill, the Legal Workforce Act, would make what is currently a voluntary system mandatory for all employers across the nation. On its face, an electronic employment verification system does not sound too bad. It is already against the law to hire unauthorized immigrants, so why not use the Internet to verify someone’s status? The problem is that the program boasts significant flaws that should cause concern for all Americans. Most significantly, the system’s track record is terrible when it comes to unauthorized immigrants, failing to identify them more than half of the time. Even for workers who are U.S. citizens, the system is unacceptably error prone. If the program became mandatory today, it would cause 770,000 legally present and legally authorized workers to lose their jobs. Imagine being born in America and living here your entire life, only to learn that a government database deems you ineligible to work. All for a system that is only 46 percent accurate when it comes to catching undocumented immigrants. Once again, putting these immigrants on a path to legal status would allow the country to focus on the merits of the issue—whether, for example, we really want to force employers to check with the federal government before hiring someone. Conservative state legislatures across the country want to require certain voter identification documents in the name of preventing voter fraud by noncitizens. But an infinitesimal number of cases of voter fraud have been identified, while a large number of groups are likely to be disenfranchised by these rules. The groups most likely to lack necessary documentation are the poor, the elderly, and communities of color. Some conservatives use the specter of immigrants voting unlawfully to promote policies that once again adversely affect millions of Americans. Creating a path to legal status for the nation’s undocumented immigrants would help clarify that these voter ID efforts are not designed to protect against fraud but rather to suppress voter participation. The REAL ID Act, ostensibly passed to enhance national security by preventing terrorists from getting drivers’ licenses, was championed by immigration restrictionists who saw it as a check on the effort of some states to provide undocumented immigrants access to driver’s licenses. Because full implementation of the act would have involved massive database sharing between states and the federal government, it created the architecture for a national ID card—triggering a grassroots backlash from the left and the right. That backlash dramatically stalled the act’s implementation, with states and localities refusing to participate. This highlights yet again how the existence of millions of undocumented immigrants became a smokescreen for an effort to advance another agenda—the creation of a national ID card. That is a fair issue to debate on the merits. But because it wasn’t addressed directly, we ended up with a failed policy in the REAL ID Act. If the concern is really about undocumented immigrants getting driver’s licenses, then the most obvious and effective approach would be to require undocumented immigrants to register and earn legal status. Allowing them to do so would also reduce the number of people who have no choice but to drive without licenses and insurance in order to make a living and feed their families. Many sectors of our economy depend heavily on immigrant workers, including agriculture, construction, hotels, and restaurants. In some industries, undocumented immigrant workers make up significant proportions of the workforce. As we have shown elsewhere, the economic impact of removing all of these workers would be catastrophic. But the status quo is likewise untenable because the relentless drumbeat of federal immigration enforcement and the efforts by some states to demonize the undocumented makes these workers increasingly vulnerable. These efforts are not just bad for the marginalized workers—they hurt all Americans. Good-faith employers must compete against bottom feeders who exploit this vulnerable workforce, and native-born workers must compete against workers who cannot protect their basic rights, including the right to fair wages. It is a lose-lose situation that would be flipped to a win-win if our Congress had the courage to create a process for legalizing hardworking immigrants who are committed to this country. Our failure to tackle this issue has disproportionately harmed certain industries, including agriculture and the service sector. Nowhere is the tension between immigrant labor and the economy more obvious than in agriculture. By most estimates, undocumented immigrants make up more than half of the workers in the agriculture industry. Likewise the U.S. Department of Agriculture has estimated that each farm job creates three “upstream” jobs in professions such as packaging, transporting, and selling the produce, meaning that what happens in the agricultural sector affects the economy as a whole. Agriculture is particularly susceptible to the whims of the labor market, since crops become ripe at a fixed time and must be picked quickly before they rot. Migrant laborers often travel a set route, following the growing season as it begins in places such as Florida and works its way north. Disrupting this flow of pickers can be devastating to local economies and the nation’s food security. After the passage of Georgia’s anti-immigrant law, H.B. 87, for example, the Georgia Agribusiness Council estimated that the state could lose up to $1 billion in produce from a lack of immigrant labor. A survey of farmers conducted by the Georgia Department of Agriculture found 56 percent of those surveyed were experiencing difficulty finding workers—a devastating blow to the state. Even a program by Gov. Nathan Deal (D-GA) to use prison parolees to fill the worker shortage quickly fell apart, with most walking off the job after just a few hours. Creating a process for legalizing these undocumented workers would help stabilize the agricultural workforce and enhance our nation’s food security. It would also diminish the incentive of states to go down the economically self-destructive path that Georgia, Alabama, Arizona, and others have pursued. As with the agriculture industry, the service sector, particularly hotels and restaurants, have been hit hard by the failure to achieve immigration reform, along with the host of state laws criminalizing the undocumented. Roughly 2 million of the 23 million immigrant workers in the United States work in the service sector. And as Darrell M. West of the Brookings Institution pointed out, immigrants end up working in many jobs in places like hotels and restaurants—industries where there are just not enough native-born workers willing to do the jobs. Arizona provides a case study in how the politics of the undocumented can affect the service sector. In 2010 the state passed S.B. 1070, a comprehensive anti-immigration law. Passage of the bill resulted in a significant blow to the tourism industry, with a major boycott of the state and a number of prominent national groups refusing to hold conferences and events in the state. All in all, research conducted by the Center for American Progress found that in the first year of the law alone, Arizona lost a total of $141 million, including $45 million in hotel and lodging cancellations. The lack of tourists not only affected the livelihoods of immigrants but of the native born as well: An estimated 2,700 jobs and a total of $253 million in economic impact disappeared in one year alone. Immigrant labor is critical to keeping our service sector running, and no better example can be found than during the recent Hurricane Sandy. As Ted Hesson of ABC-Univision News reported, “immigrant jobs [kept] New York City running during Sandy,” as they drove taxis, delivered food, and provided health care, just as a few examples. The failure to deal realistically with our nation’s large and long-settled undocumented population is economically self-defeating in its own right. This brief highlights how that failure has created roadblocks to honest discussions and meaningful solutions on a variety of other important issues as well. It is high time we do what’s right for our country and end the gridlock on this issue. Smart policy and good politics are squarely aligned. Congress must act to create a roadmap to citizenship for these hardworking immigrants. Marshall Fitz is the Director of Immigration Policy at the Center for American Progress. He would like to thank Max Lesser, intern with the Immigration team, for his help in writing this article.